Estrella’s journey is over, but the Nanocosmos adventure goes on. After six months of work, the team formed by CSIC staff and the LuzLux production company, among others, has completed the documentary “Nanocosmos, a journey to the origins of dust grains, a road movie which talks about the technological and human challenge that lies behind the development of instruments in the area of Laboratory Astrophysics. The story unfolds in three levels: the journey of the recording team from Madrid (Spain) to Toulouse (France), the laboratory experiments explained by its principal investigators and the journey of the cosmic dust grains since they are born in the envelope of an evolved star until they become part of something bigger (a star, a planet or, why not, a living being). This work wants to transmit the expectations of the teams struggling to understand this process, the technological and human challenge involved in building complex machines with a goal: to reproduce in a laboratory what happens in space. The 40-minute documentary will circulate along circuits of scientific movies and specific science channels for a year, and after that it will be available on the Nanocosmos’ website. This is the trailer announcing the documentary. The movie is available in Spanish with subtitles in English and French. 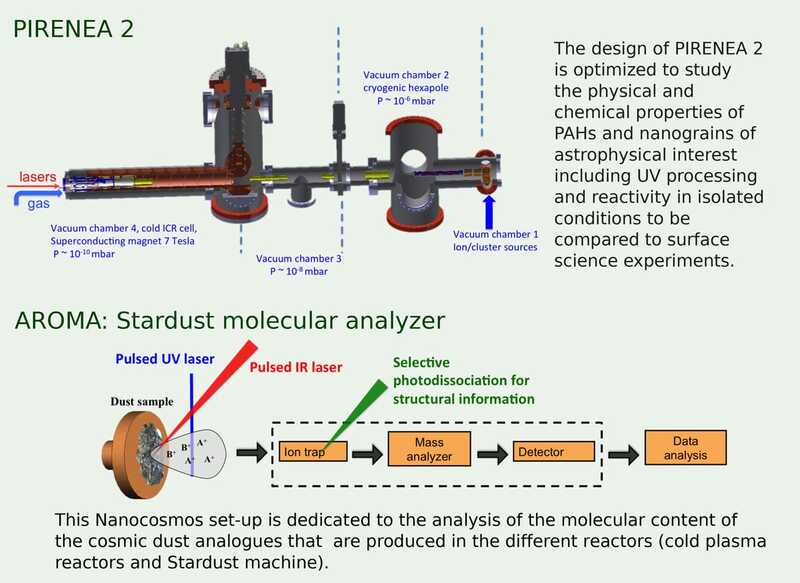 ESPOIRS Setup: Spectroscopic Study of the Optical Properties of analogues of interstellar grains in the Infrared and Submillimeter. PIRENEA SETUP: Ion Trap for the Research and Study of New Astrochemical Species. 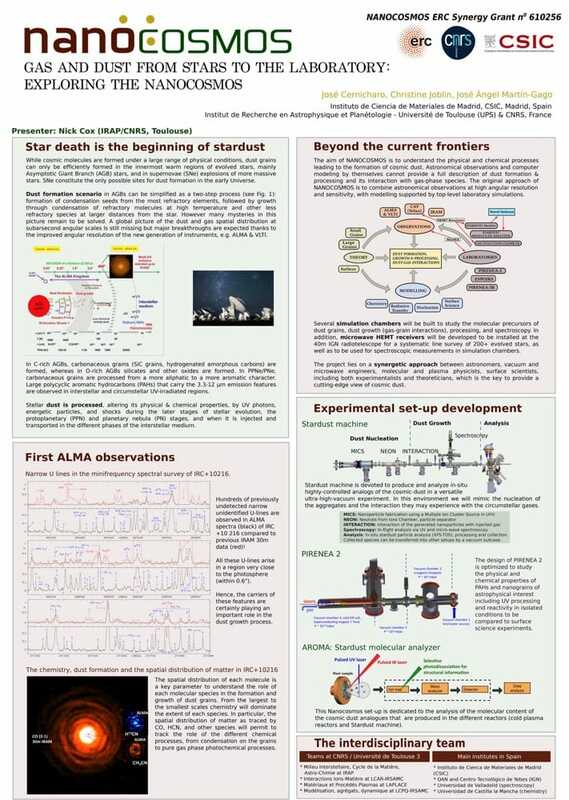 It is an original set-up for laboratory astrophysics dedicated to the study of the photophysics and chemistry of macromolecules and nanograins in interstellar conditions. 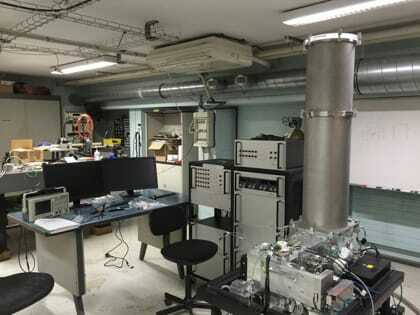 Learn more about the ESPOIRS and the PIRENEA laboratory experiments currently on process at IRAP in Toulouse. 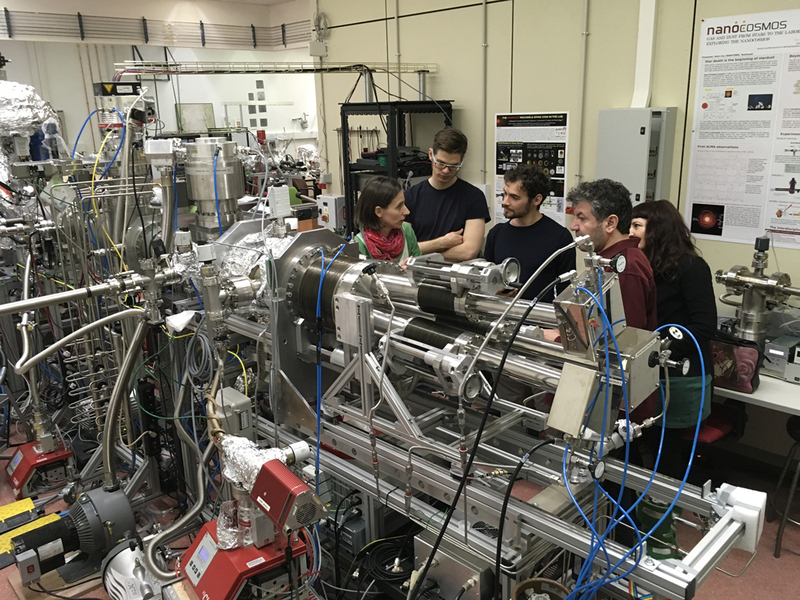 After being « extracted » from the Stardust Machine, Estrella and her father are leaving Madrid in a vacuum suitcase traveling to the IRAP, in Toulouse, France, where the molecular content of cosmic dust analogs is analyzed by the AROMA and the PIRENEA 2 setup. INFRA chamber: In-flight analysis will be performed through UV, visible, near-mid and far-infrared spectroscopy as well as microwave spectroscopy with the new HEMT receivers (developed in CNIG/IGN) that will provide the opportunity to study second/minute time-dependent changes in the gas composition using these extremely sensitive radio astronomical receivers. Stars are formed in clouds of gas and dust, known as nebulae. Nuclear reactions at the core of stars provides enough energy to make them shine brightly for many years. The exact lifetime of a star depends very much on its size. Very large, massive stars burn their fuel much faster than smaller stars and may only last a few hundred thousand years. Smaller stars, however, will last for several billion years, because they burn their fuel much more slowly. Eventually, however, the hydrogen fuel that powers the nuclear reactions within stars will begin to run out, and they will enter the final phases of their lifetime. 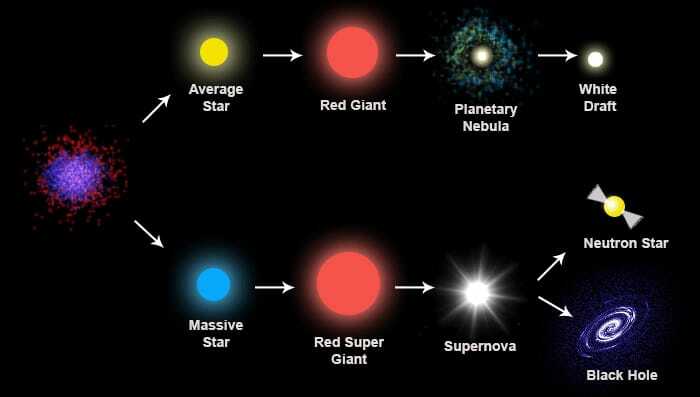 Over time, they will expand, cool and change color to become red giants. The path they follow beyond that depends on the mass of the star. Small stars, like the Sun, will pass through a planetary nebula phase to become a white dwarf, this eventually cools down over time leaving a brown dwarf. Massive stars, on the other hand, will experience a most energetic and violent end, which will see their remains scattered about the cosmos in a enormous explosion, called a supernova. Once the dust clears, the only thing remaining will be a very dense star known as a neutron star, these can often be rapidly spinning and are known as pulsars. If the star which explodes is especially large, it can even form a black hole. Watch this video about the Molecular Astrophysics Group of the Instituto de Ciencia de Materiales de Madrid, CSIC, led by José Cernicharo. 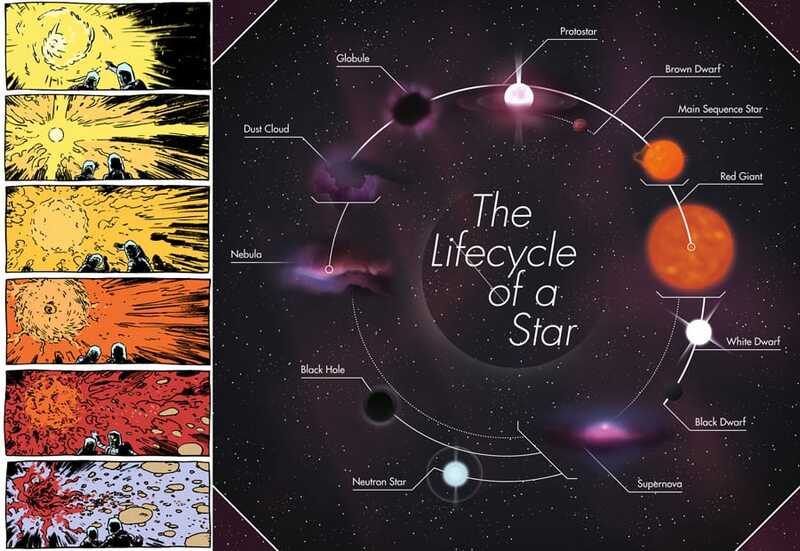 A video of the illustrated talk by Christine Joblin (research director at CNRS in Toulouse) and Lorenzo Palloni, comic artist of the ESTRELLA webcomic. 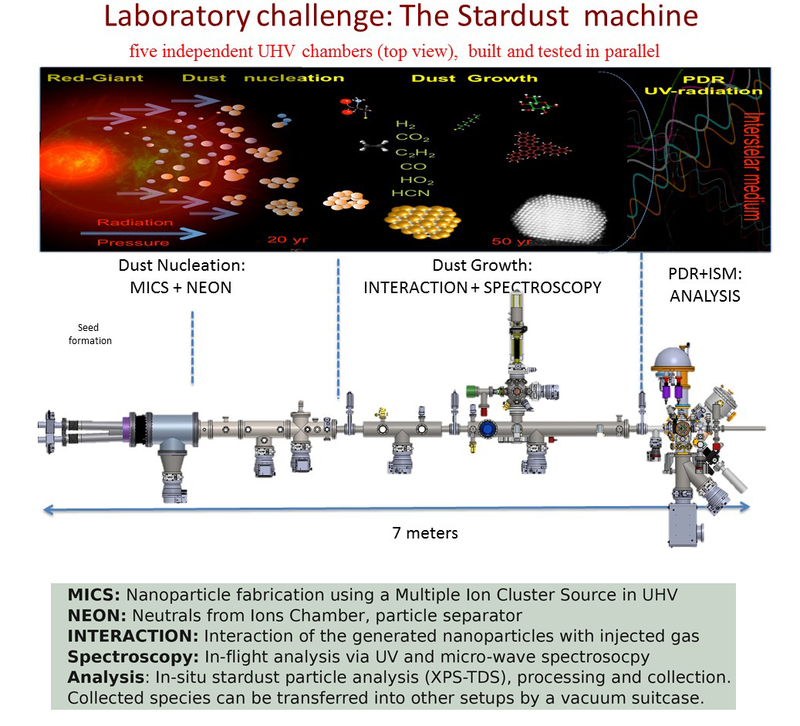 The Stardust machine is devoted to produce and analyze in-situ highly-controlled analogs of the cosmic-dust in a versatile ultra-high-vacuum experiment. 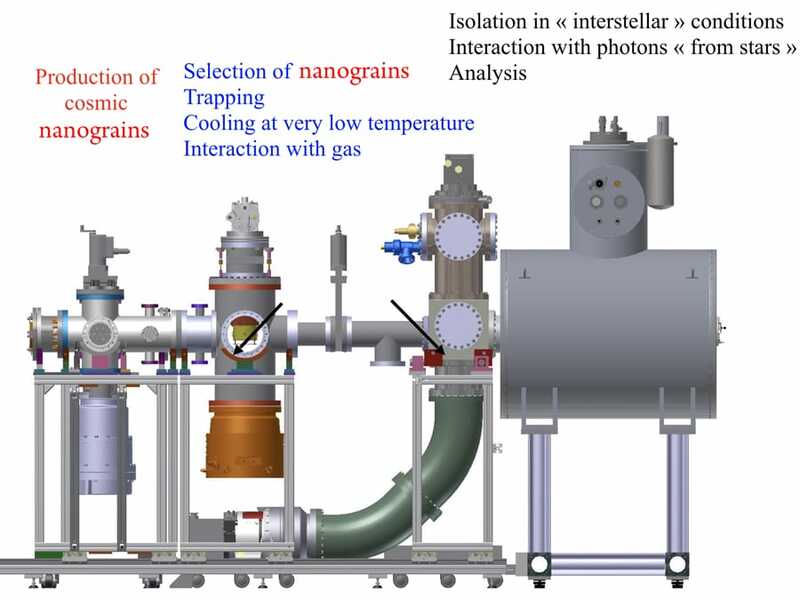 In this environment the Nanocosmos team will mimic the nucleation of the aggregates and the interaction they may experience with the circumstellar gases. Learn more on the Nanocosmos website. Comics artist Lorenzo Palloni visiting the Stardust Machine with Researcher José Ángel Martín Gago. Cosmic dust is made in evolved stars. However, the processes involved in the formation and evolution of dust remain so far unknown. 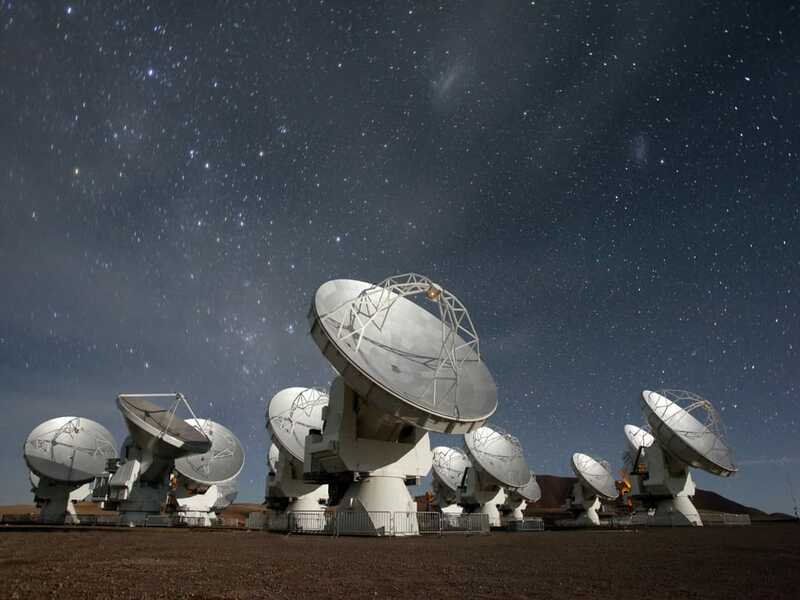 NANOCOSMOS takes advantage of the new observational capabilities (increased angular resolution) of the Atacama Large Millimeter/submillimeter Array (ALMA) to unveil the physical and chemical conditions in the dust formation zone of evolved stars. These observations in combination with novel top-level ultra-high vacuum experiments and astrophysical modelling will provide a cutting-edge view of cosmic dust. Click on the image to download the high-resolution PDF.